Arthur Agee and Will Gates, two of Chicago's top high school basketball prospects, face pressure on and off the court in this iconic documentary about sports, family and race. Roger Ebert: No screenwriter would dare write this story; it is drama and melodrama, packaged with outrage and moments that make you want to cry. ''Hoop Dreams'' (1994) has the form of a sports documentary, but along the way it becomes a revealing and heartbreaking story about life in America. When the filmmakers began, they planned to make a 30-minute film about eighth-graders being recruited from inner-city playgrounds to play for suburban schools. Their film eventually encompassed six years, involved 250 hours of footage, and found a reversal of fortunes they could not possibly have anticipated. Dazed interview with filmmaker Steve James: Frequently in documentaries – there are plenty of exceptions – people try to present things in a very black and white manner, to condemn or critique and not hold on to the complexity that I think is the higher calling of documentary. It was very clear to us that we weren't going to make a film that was simply a diatribe against the business of sports. It is a business and there is exploitation but at the same time, it's also this opportunity for those involved. Sports are something that so many of us are invested in as fans and participants. It's complicated, and we wanted to hold on to that complicated reality. WaPo Review: The realities of American life are the film’s true subject, particularly that debilitated segment of the population that sustains itself with impossible dreams of escape. Certainly, no other movie—documentary or dramatic feature—in recent memory provides such a vivid account of inner city culture. Looking Back at Broken 'Dreams': You can almost smell Emma Gates's battered chicken crackle and pop in her fryer, and feel the empathy in William's mother when she says: "I really thought Curtis was going to make it, so I just wanted this one to make it. I want him to make it so bad, I don't know what I'm going to do." And the suburban Catholic high school, plucking talented children from the playground and then playing God with their lives -- keeping one enrolled, discarding the other. You see Sheila Agee as she extricates herself from welfare and enrolls in a nursing class. She finishes with the highest grade-point average and graduates quietly in a large room with a few other classmates. "I didn't think I could do it," she says, crying. "And people told me I wasn't going to be anything." WSJ: What ever happened to the stars of 'Hoop Dreams'? Documentary available here on YouTube and on Netflix. Thanks. This was recently screened in a local theater for its 20th anniversary and it remained just as devastating, uplifting, and complicated as it was the first time I saw it when it aired on PBS. There was a brief segment shown afterwards where Steve James shared more about what Art and Will are up to these days--Will and his family have moved to San Antonio, where Will's son was a local high school basketball star (who recently announced a transfer to Houston Baptist). Art is still living in Chicago, active with the Arthur Agee Foundation. You can follow him on twitter. 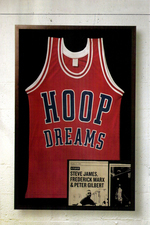 Hoop Dreams was shot primarily on analog Beta SP videotape, so the image was cropped and transferred for its commercial release. Working from multiple elements, including standard definition video masters and a 35mm film print, the project team created a new uncropped, high definition digital master that better represents the pictorial quality of the original videography. Digitally remastered at Modern VideoFilm with sound restoration by Audio Mechanics, this version allows future audiences to see the film as conceived by its filmmakers.